Alternative Heating & Air Conditioning Solutions, Inc.
You can trust they will do a good, quality job. Any time homeowners have AC or heaters installed, they want to trust the company will do a very good job and these guys did a very fantastic job. I was very pleased with it. They were neat and cleaned up well. They were professional and very fast. I refer them all the time. I have their magnet business cards. They were able to do the installation in hard conditions and they were good. They are great people and they did a beautiful job. He even put in some extra ducting for me. They installed it when it was 100 degrees out and their prices were very reasonable for the amount of work that they did. I have been using them since 1993 and Mike is fabulous. The guys who work for him are fabulous as well. They are always on time and they explain what they are doing. I am just very satisfied with them. They come in, they know what they are doing, and they are very polite. I am very satisfied with what they have been doing. Alternative Heating & Air Conditioning Solutions, Inc. offers home and business owners optimal, efficient heating and air conditioning systems that are designed to meet their personal needs. These designs include features such as variable speed capabilities; two-stage heating and air conditioning; zoning; ductless split systems for server rooms, studios or game rooms; indoor air quality improvements; and air filtration. Alternative Heating & Air Conditioning Solutions also installs a variety of Green HVAC products that are designed to achieve optimum energy management through environmentally-friendly means, including hot water fan coils and ductless split systems that can heat or cool multiple rooms at the same time. “We understand that Green HVAC solutions are becoming increasingly important to consumers, so we strive to remain on the cutting edge of this technology,” says Mr. Rebholtz. DIAMOND CERTIFIED RESEARCHED CAPABILITIES ON Alternative Heating & Air Conditioning Solutions, Inc.
Company Name: Alternative Heating & Air Conditioning Solutions, Inc.
DIAMOND CERTIFIED RESEARCHED ARTICLES ON Alternative Heating & Air Conditioning Solutions, Inc.
General Manager Mike Rebholtz works on a customer’s HVAC system. Alternative Heating & Air Conditioning Solutions provides a variety of HVAC services for residential and commercial clients in San Mateo, Santa Clara, Alameda and San Francisco Counties. In addition to installing, repairing and maintaining high-efficiency heating and cooling systems made by industry leaders like Trane, Bryant and Carrier, the company performs load calculations, offers custom duct work, and more. Make sure ducts are sealed. Poorly sealed and insulated ductwork can account for a surprising amount of energy loss, so check the seals on all the ducts that run through your attic, garage and crawlspaces. You should have a professional HVAC technician handle the job, but if you need a quick fix, use duct sealant or metal-backed tape to seal all seams and connections. Don’t use duct tape—it doesn’t have the right amount of staying power. Q: How long will it take to install a new furnace in my house? A: It depends on the nature of the installation. Swapping out an existing furnace usually takes about half a day, but installing an entirely new system can take up to three days. 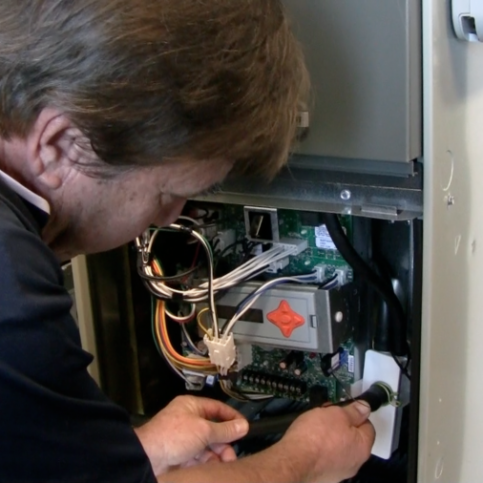 Q: What exactly is involved with a furnace tune-up? A: We use a 16-point checklist to ensure each furnace is operating at peak efficiency. You’ll get a copy of this checklist so you can see exactly what was inspected and what condition your furnace is in. Q: What does it mean if my furnace is rated 80 percent efficient? A: The efficiency rating is based on the ratio of heat from burned fuel that’s pumped into your ductwork and actually heats your home or business. If you have a 100,000 BTU furnace that pumps 80,000 BTUs into the ducts, your furnace is 80 percent efficient (the rest of the heat goes up the flue). If you have a high-efficiency furnace (95 percent), you can burn less fuel and produce the same results. Q: Should I get a more efficient blower for my furnace? A: It depends on the specifics of your electricity bill, but we usually recommend getting a high-efficiency blower. Californians typically spend 30 percent of their utility bills on gas and 70 percent on electricity, so if you can decrease your electricity consumption by getting a more efficient blower, it’s usually a better investment than upgrading your furnace to reduce your gas consumption. Q: Why should I replace my ductwork? A: Older duct systems tend to have leaks and usually aren’t insulated as well as newer systems. We can often save our customers 20 to 30 percent on their energy bills just by replacing old ducts. SELECTED PHOTOS FROM Alternative Heating & Air Conditioning Solutions, Inc.
Mike Rebholtz is general manager of Alternative Heating & Air Conditioning Solutions, Inc., a Diamond Certified company since 2012. He can be reached at (650) 539-9722 or by email. Outside of work, Mike engages in a wide variety of active pastimes. “I can’t get enough of the outdoors, whether it’s riding my motorcycle, fishing or backpacking in the Sierras,” he says. As a licensed pilot, Mike says he and his wife also enjoy flying to nearby destinations for weekend trips. Additionally, he likes spending time with his three children, Courtney, Shane and Shelby, all of whom are currently attending college. Q: Would you ever go sky diving? A: Yes, that’s actually on my bucket list. A: The Mountain House Restaurant in Woodside. Q: What kind of books do you like to read? A: I like everything from mystery novels to self-improvement books. As a pilot, I’m also fascinated by World War II stories, so I love any book that has to do with that era. MENLO PARK — If you’re planning to replace your furnace, there’s a chance you may need to replace your air ducts as well. Due to a recent Title 24 mandate, Bay Area residents planning for furnace replacements are now required to have their ductwork tested for energy efficiency using what’s known as a HERS (Home Energy Rating System) test. If the test determines your ducts have more than 15 percent leakage—which is highly likely in homes more than 30 years old—they’ll need to be replaced in conjunction with the furnace. Duct replacement is expensive initially, especially if asbestos removal is needed, but once the new ducts are installed, they provide several benefits. For one, your home’s indoor air quality will improve significantly, since the new ducts won’t be pushing old dust and debris into your home’s airflow. Also, by eliminating air leaks, your utility bills will likely decrease by 20 to 30 percent, saving you money over the long run. Additionally, a duct replacement will allow your HVAC technician to perform modifications and improve the airflow to certain areas of your home. MENLO PARK — Host, Sarah Rutan: If you’re thinking about switching to solar power in your home, you should also consider installing a heat pump for your HVAC system. Today we’re in Menlo Park with Diamond Certified Expert Contributor Mike Rebholtz of Alternative Heating & Conditioning Solutions to learn more. Diamond Certified Expert Contributor Mike Rebholtz: I’m here today to talk about heat pumps. A lot of people are questioning, you know, what is a heat pump? What do they do? How will it heat my home? Does it air condition well? Is it efficient? And I really start talking to people about heat pumps when we’re talking about if they have solar and they want to start getting off the grid or if they’re on propane and they don’t want to use propane to heat their home. They want to use electricity. So, when we heat and cool on a heat pump, we’re doing it with electricity. They’ve become very efficient. They’ve become a lot more – they produce a lot more heat than they used to. We’ve gone from an R22 refrigerant to a 410A refrigerant, which means that it could produce six to ten degrees more heat than they ever used to. Efficiencies have gotten much better. They’ve gone to variable-speed compressors, which are very efficient. And they don’t pull a lot of energy off the grid immediately. They just gradually come up. And so we find that heat pumps have a really good place here in the Peninsula with a lot of people that are doing solar. MENLO PARK — Host, Sarah Rutan: If your home’s furnace ducts are more than 30 years old, it may be time to consider having them replaced. Today we’re in Menlo Park with Diamond Certified Expert Contributor Mike Rebholtz of Alternative Heating & Air Conditioning Solutions to learn more. 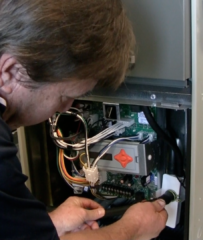 Diamond Certified Expert Contributor, Mike Rebholtz: When you’re thinking about getting your furnace replaced, there’s a new mandate out now, it’s a new Title 24 requirement throughout the whole Peninsula in here. It’s a HERS test, it’s a duct test that’s required where you have to have less than 15 percent leakage. If your home is over 30 years old, there’s a good probability that your duct will need to be replaced. It won’t pass the duct test. You can look at your ductwork. If it’s in the crawl space, you’ll see vents on the floor. If it’s in the attic, you’ll see the registers in the ceiling. So, to inspect it, see if you got black rings on, like, yellow or orange insulation. If it’s tin ductwork, it may have asbestos, it will be white, and inside it’s going to be shiny or on the outside, like I say, could have some rust on it. But an expert will know right off what it is. It’s expensive to do this duct replacement initially because you may have asbestos removal, but the indoor air quality will improve 100 percent. You won’t have any more of this dust or debris in there. Also your utility bills will drop 20 to 30 percent. It’s just not about replacing your furnace, it’s about replacing the airflow. We can also modify the airflow at doing your duct replacement. We get better airflow to your living room, maybe to a master bedroom, and this is all done with a duct replacement. Diamond Certified RATINGS ON Alternative Heating & Air Conditioning Solutions, Inc. Alternative Heating & Air Conditioning Solutions, Inc. : Average 9.3 out of 10 based on 143 unique customer surveys of customer satisfaction. I felt that they were very polite and were very clean. They took the time to make sure I knew what was happening every step of the way. Everyone they sent out to do their work is dependable and knowledgeable about their expertise. I have no complaints. I would recommend them. They always have been courteous and prompt. They are dependable, reliable and friendly. I can only think of one word, trustworthy. The fact that they did not overcharge us for the work that was done and actually came in under budget. They came in and did what they said they were going to do, they were clean and well priced. The pricing and the quality of workmanship is fantastic. Mike is one of the most honest people I have ever met in my life. The quality of his work I have known Mike for over thirty two years and he was my only technician that I used in my home for the same amount of time. They are very reliable, efficient, and always on time. They were available when everyone else was closed, it was the day before Christmas, and they were there. They have good hours, they came when they were supposed to, and took care of business. It was a good transaction. Their professionalism, being open for my needs, and coming at the time they said they would. It was an emergency for me, the day before Christmas, and I needed my heater on. They did a good job. They completed the work and there were no problems afterwards. They gave me some additional information about how to hook up a thermostat.